KPIs can also define actions. See Defining Custom Actions in the DeepSee Implementation Guide. Typical dashboards include one or more filter controls, with which the user interacts with the widgets on the dashboard. Each filter control is typically displayed as a drop-down list. A filter can filter the data displayed by a widget, or it could affect the data source in some other different manner. You define each filter; that is, you specify the filter names and the items in the filter lists. You can skip this step if you intend to use filters provided by a pivot table. You specify the KPI query programmatically so that it uses the filters. To do this, you implement a callback method in the KPI so that it overrides any hardcoded query. Within this method, you have access to the selected filter values. In typical cases, you add a WHERE clause (or %FILTER, for an MDX query) that restricts the records used by the query. Then when the user refreshes the dashboard, DeepSee reruns the query and displays the results. Because you construct the KPI query yourself, you can use filters in more general ways. That is, you are not required to use the filter selection to affect the WHERE (or %FILTER) clause of the query. For an extreme example, a filter could display the options 1, 2, and 3. Then the KPI could execute version 1, 2, or 3 of the query, which might be entirely different versions. For another example, a filter could display a list of measure names, and the KPI could include the selected measures in its query. A dashboard can contain both KPIs and pivot tables, displayed in scorecards, pivot table widgets, or other widgets. Within a dashboard, a filter can be configured to affect multiple widgets. It is possible to define filters that affect both KPIs and pivot tables. Pivot tables send and receive filter values in a specific syntax, described in the following subsection. To create interoperable filters, you must consider this requirement; the second subsection describes two possible approaches. The following table indicates the filter syntax used and expected by pivot tables. This syntax applies to pivot tables that are displayed in any kind of dashboard widget. Other than the optional %NOT string, the filter names and filter values are not case-sensitive. You can create a KPI that defines and uses filters in the format required by pivot tables. You can define a KPI that converts filter names and values from the pivot table format to the format needed for the KPI query. These approaches can work with either MDX-based or SQL-based KPIs, but more work is needed to convert values when you use an SQL-based KPI. The Favorite Color filter is configured as part of the upper widget and is therefore defined by the pivot table that is displayed in that widget. Favorite Color is a level in the cube on which this pivot table is based. The Doctor Group filter is configured as part of the lower widget and is therefore defined by the KPI that is displayed in that widget. This filter is defined programmatically within this KPI. This filter is defined to use values in pivot table format, as given in the previous section. For both of these filters, the target of this filter is * (which refers to all widgets in this dashboard). As you can see by experimentation, both filters affect both of these widgets. The KPI includes an additional filter (Yaxis), which controls the y-axis of the MDX query used by the KPI. This filter has no effect on the pivot table. For details on how this works, see Additional MDX KPI Examples, later in this chapter. Specify the list of filters. Each filter can have a logical name (required) and a display name (the same as the logical name by default). In this example, the logical filter names are MDX level identifiers. It is convenient, but not required, to specify the logical names in this way. You could instead specify filter names at runtime. See Other Options for Defining Filter Names and Items, later in this chapter. When multiselect is disabled, the Exclude option is also disabled. Define the filter items for each filter. Each filter item can have a logical name (required) and a display name (the same as the logical name by default). It is useful if the logical names are the same as MDX member keys; otherwise, more work is needed to construct filter clauses, as described later in this chapter. For details on %OnGetFilterMembers(), see the first subsection. The example shown here uses the %GetMembersForFilter() method; for details, see the second subsection. You could instead hardcode the filter items; see Other Options for Defining Filter Names and Items, later in this chapter. Modify the query to use the value or values selected by the user. See Modifying an MDX Query to Use Filter Values, later in this chapter. pFilter is the logical name of a filter. pMembers specifies the members in a $LISTBUILD list. This list contains both the logical names and the display names. For details, see the class reference for %DeepSee.KPI. pSearchKey is the search key entered by the user. You can use this method in any KPI, regardless of the type of query it uses. If the logical names of the filters are MDX level identifiers, you can use a simple implementation as shown previously. If not, it is necessary to do more work before getting the members. For examples, see Using Custom Logic to Build the List of Filter Items at Runtime, later in this chapter. pCube is the logical name of a DeepSee cube, with .cube appended to it. pFilterSpec is a MDX level identifier (for example, "[DateOfSale].[Actual].[YearSold]"). pMembers, which is returned as an output parameter, is a list of members in the form required by %OnGetFilterMembers(). In this list, the filter items are member keys. This method is more useful for MDX-based KPIs than for SQL-based KPIs. For an SQL-based KPI, you would need to convert the filter values to a form suitable for use in your query. One option is to specify the <filter> element of the <kpi> element; see the previous section. Or you could instead specify filter names at runtime. See Other Options for Defining Filter Names and Items, later in this chapter. Within each <filter> element, specify the following multiSelect, searchType, and dependsOn attributes as wanted. See the previous section. One option is to implement the %OnGetFilterMembers() method, described earlier in this chapter. Modify the query to use the value or values selected by the user. See Modifying an SQL Query to Use Filter Values, later in this chapter. pFilters  Specifies the number of filters. A string that equals the logical name of the filter. A string that equals the display name of the filter. A string that equals the filter property; the default is the logical name of the filter. 1 or 0 to indicate whether multiselect is enabled for this filter. Use 1 to enable multiselect or 0 to disable it. pDataSourceName is for future use. Another way to build the list of filter items is to specify the valueList attribute of the <filter> element. Use a comma-separated list of logical names for the filter items. The order of this list determines the order in which filter controls list the filter items. This attribute takes precedence over the sql attribute. If you specify this attribute, you can also specify the displayList attribute, as shown above. If specified, this must be a comma-separated list of display names. If you do not specify this attribute, the logical names are also used as the display names. Another way to build the list of filter items is to specify the sql attribute of the <filter> element. If specified, this must be an SQL query. The query can return either one or two columns. The first column in the returned dataset must provide the logical names for the filter items. The second column, if included, provides the corresponding display names. If you do not include a second column, the logical names are also used as the display names. If you specify the sql attribute, do not specify the displayList or valueList attributes (see the previous subsection). 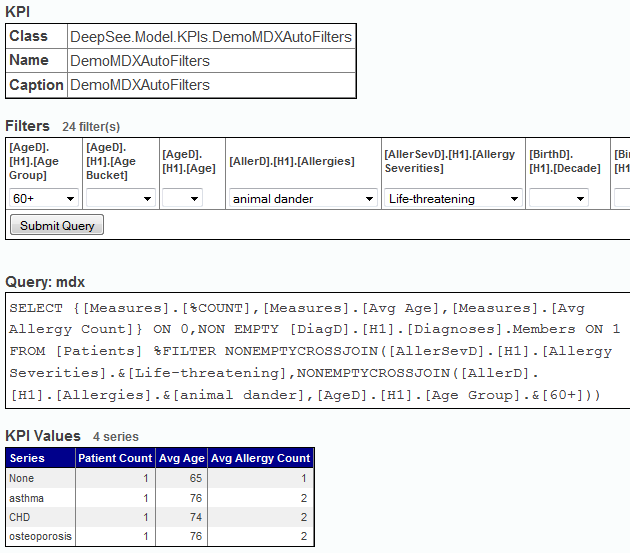 Set sql = "SELECT DISTINCT DxAgeGroup FROM DeepSee_Model_PatientsCube.DxAgeGroup"
Note that this example does not use the pSearchKey argument. /// Return an MDX statement to execute. If there is no initial query, specify an initial value of the variable pMDX. This should be an MDX SELECT query. There is no initial query if you do not specify a query in the mdx attribute, as described in the previous chapter. Examine each applicable filter and get its value. To do this, use the %filterValues property of your KPI instance, as described in the first subsection. Parse each filter value and convert it as needed to a form that can be used in an MDX %FILTER clause (if that is how you intend to use the filter). For a table that lists the suitable forms, see the second subsection. Where mdx_expression is the expression for that filter, as created in the previous step. In more exotic cases, you could use the filter values to rewrite the query string in other ways. The last subsection provides an example. It has one property for each filter in the KPI, with the same name (case-sensitive) as the filter. For example, if a KPI has filters named filter1, filter2, and filter3, then the %filterValues property of your KPI instance has properties named filter1, filter2, and filter3. The following table lists appropriate MDX expressions to use in %FILTER clauses, depending on user selections. For an example, see the method BuildString() in the sample class DeepSee.Utils.MDXAutoFiltersKPI. Note that if multiselect is disabled, EXCLUDE is also disabled, and there are fewer possible forms of filter values. In this case, query construction is comparatively simple. set pMDX = pMDX _ " %FILTER [aged].[h1]. [age group]." _..%filterValues."[aged].[h1]. [age group]"
set pMDX = pMDX _ " %FILTER [gend].[h1].[gender]." _..%filterValues."[gend].[h1]. [gender]"
set pMDX = pMDX _ " %FILTER [homed].[h1].[zip]." _..%filterValues."[homed].[h1]. [zip]"
"[aged].[h1]. [age group]" is a valid property name. ..%filterValues."[aged].[h1]. [age group]" is a reference to the "[aged].[h1]. [age group]" property of the %filterValues property of the KPI instance. /// Return an SQL statement to execute. The variable pSQL contains the SQL query specified in the sql attribute of <kpi>. If you did not specify that attribute, pSQL is null. If there is no initial query, specify an initial value of the variable pSQL. This should be an SQL SELECT query. There is no initial query if you do not specify a query in the sql attribute, as described in the previous chapter. Use the %GetSQLForFilter() method, which returns values in a convenient format for use in the WHERE clause of an SQL query. See the first subsection. Use the %filterValues property of your KPI instance, as described in the previous section. Modify the variable pSQL to use the filter values, as appropriate for your needs. In the most common case, modify the query to include an SQL WHERE clause. The second and third subsections provide examples. An SQL-based KPI cannot have more than 1000 rows; the system automatically limits the number of rows returned. Examines the current filter selections and returns a string that you can use in the WHERE clause of an SQL query. sql_field_expression is an SQL field name and can include Caché arrow syntax. filter_name is the name of a filter defined in this KPI. The following table shows the values returned by this method call, in different scenarios. The following example is from DeepSee.Model.KPIs.DemoSQL. In this case, the filter adds GROUP BY and ORDER BY clauses to the SQL query. Set pSQL = "SELECT Count(*),AVG(Age) FROM DeepSee_Study.Patient "
Set groupby="GROUP BY HomeCity "
Set orderby="ORDER BY HomeCity "
Set tWHERE = tWHERE _ $S(tWHERE="":"",1:" AND ") _ " Outlet->City = '" _ ..%filterValues.City _"'"
Set tWHERE = tWHERE _ $S(tWHERE="":"",1:" AND ") _ " Product = '" _ ..%filterValues.Product _"'"
In this case, the KPI defines the initial query within the sql attribute, as described in the previous chapter. The %OnGetSQL() method modifies that query. This section discusses some other MDX KPI examples. This KPI extends the sample DeepSee.Utils.MDXAutoFiltersKPI, which defines the filters and rewrites the query. %OnGetFilterList() retrieves all the levels defined in the cube, as given by the CUBE class parameter. %OnGetFilterMembers() is implemented. For each level, it retrieves the level members, in the format required by pivot tables; see Filter Syntax for Pivot Tables, earlier in this chapter. The instance method FilterBuilder() iterates through the cube-based filters, retrieves the current value of each, and then combines them into a string that is suitable for use as an MDX %FILTER clause. %OnGetMDX() appends the %FILTER clause to the hardcoded query. Finally, %OnGetMDX() constructs the MDX query. The Yaxis filter determines which level is used for rows. Then the method appends the %FILTER clause to the query; the %FILTER clause uses any cube-based filters as in the previous example. set yaxis=", NON EMPTY [profd].[h1]. [profession].MEMBERS ON 1"
set yaxis=", NON EMPTY "_..%filterValues.Yaxis_".MEMBERS ON 1"
You can define a KPI so that it includes a listing option. In this case, if the KPI also includes filters, the listing definition must consider the filter selections. pSelection("selectedRange") Currently selected cells in the pivot as a string in the form "startRow,startCol,endRow,endCol" (1-based). pSelection("rowValues") Comma-separated list of the values for the selected rows. In these values, any comma is presented as a backslash (\). If no property of the KPI is configured as the value, then this node contains the series name instead. pSelection("sortColumn") Specifies the number of the column to use for sorting the listing. Use 0 for no sorting. pSelection("sortDir") Specifies the sort direction, "ASC" or "DESC"
The method should return an SQL SELECT query. In this query, you can also use Caché arrow syntax and SQL functions, as with other listings. Or you can override the %OnGetListingResultSet() method. In this case, you must prepare and execute the result set. Set tSQL = "SELECT TOP 1000 %ID,DateOfSale,Product FROM HoleFoods.SalesTransaction"